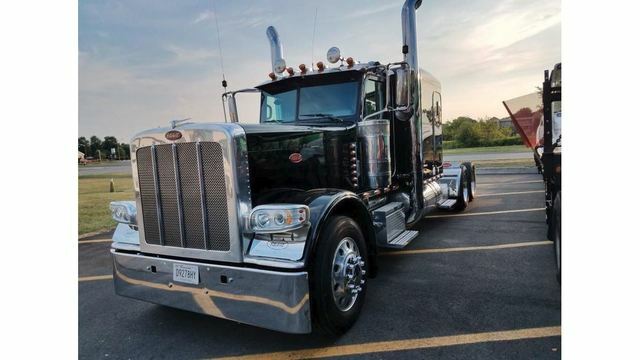 HANOVER COUNTY, Va. (WRIC) -- A Hanover County family says their world has been 'turned upside down' after their semi-truck was recently stolen. They're hoping the power of social media can help locate the stolen truck that they worked years to purchase and has since served as the main source of income for the family. "Our world has just been turned upside down," Aimee Shreffler wrote on Facebook. "That truck that you so carelessly stole was our future, our retirement, a small part of what my kids cherished about their daddy." Shawn Shreffler's semi-truck was stolen April 7 from the TA truck stop in Ashland. Local police confirmed to 8News they are investigating. "It's been horrible. it's been absolutely horrible," Shawn Shreffler said. To Shawn Shreffler, it wasn't just a truck. It's was how he supported his wife and three kids. "It took me 20 years to work and save to buy this truck, and for them to steal it is horrific," Shawn Shreffler said. The Shreffler's said the semi is worth $150,000. They added that their insurance would not reimburse them for anywhere near what the truck is worth. The semi is a 2015 Peterbilt 389 is black with dual chrome stacks and Indiana license plates. It has a flat top with dual chrome stacks and a yellow J.B. hunt lettering on the driver's side sleeper. The Shreffler's said that whoever took it, ditched the trailer with the tracking device outside of Petersburg. "We can't even comprehend the hate or the nastiness of someone that would do this," Aimee Shreffler said. The family took to Facebook to express how their lives -- and possibly even their future -- have been affected. Their pleas for help have gotten more than 15,000 shares. Now they are getting calls and tips from people who think they've seen the semi. The last tip they received was from someone who thought they had seen it in North Carolina. "You, have not only stolen our truck, our possession that my husband has worked 20+ years as a truck driver to purchase," Aimee Shreffler wrote. "That truck was his, his hard-earned work, his time away from his family, his sacrifices." The family told 8News, they are questioning how they are going to make ends meet. But one thing is for sure, they will continue to search for their semi truck.